The IPSC Rifle World Shoot 2017 was hosted by IPSC Russia from 4th to 11th of June. The competition took place near Moscow in Patriot Park in a brand new shooting range with 32 shooting bays: one 1400m bay, twenty-one 300m bays and ten 50m shooting bays. The match consisted of 30 stages over 6 days with an impressive 591 competitors from 40 countries. The Russian hosts had put a lot of effort into the event, and the ceremonies were the best ever in Practical Shooting history. The opening ceremony featured speakers of ministry level, live stream from the International Space Center with a speech by a cosmonaut, parades and a show by the Russian Air Forces acrobat team with five mig29’s flying over the spectators. Regarding competitor entrance into the country, a special law was passed to allow foreign shooters to possess weapons during the match, and the Russian border patrol had exact information on the shooters and weapons entering the country. Some shooters had to rent weapons due to embargo issues, but most were unaffected. 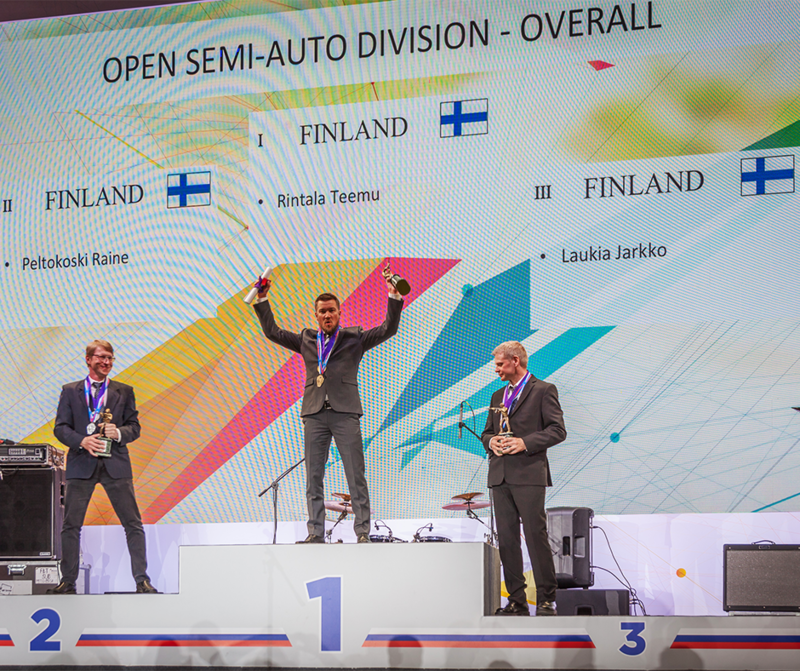 As we reported in our previous results update, the Semi Auto Open division discipline with 357 individual competitors was won by our Lapua sponsored shooter Teemu Rintala (FIN), followed by Lapua Team member Raine Peltokoski (FIN) with third Finn Jarkko Laukia clenching the bronze. 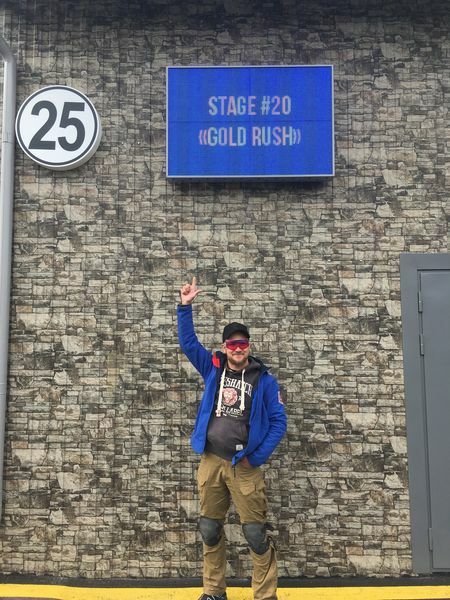 In the 127-shooter Standard division event, the Lapua-sponsored Team Finland ruled with positions 2, 3, 4, 8 and 10 going to Finnish shooters. Team Finland naturally took home the Team victories in both of these divisions. Congratulations again to all for their great achievements! From left: Raine Peltokoski, Teemu Rintala and Jarkko Laukia. Photo credit Kimmo Iso-Tuisku. “The competition was mentally and physically really hard for me. I made a lot of mistakes during the first two days. During the second day I was really crushed, and I knew that I would be outside the podium if I continued like I did. My offhand shooting was totally off and I even picked one mike from a full size IPSC target at approx. 40 meters! It was a rough day. But, with some good music and positive self-insurance, I managed to pick myself up and shot three decent stages at the end of the day. On the morning of the third day, I decided to start shooting like a man, and it worked! During the third and fourth day I didn’t make any mistakes. Going in to the fifth day, I had a nice lead, and I decided to play it safe. Good decision, only I played it too safe – Raine and Jarkko came really close at the end, but I managed to keep them behind me and win! 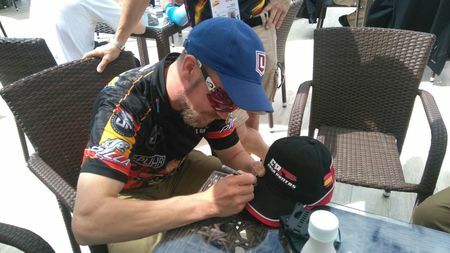 Teemu Rintala signing a cap for a fan. IPSC Russia did a great job of arranging the match. We even got a local guide from the organization to help with border proceedings. They made us feel welcome to the competition and did everything they could to have everything run smoothly. It was really nice to meet old friends and to make bunch of new ones. It was an honor to be there and be a small part in the huge competition. “I have shot practical pistol and shotgun since 1989. I started practical rifle relatively late in 2005 and the reason was that the World Championships were scheduled to be held in 2006 in Denmark and I wanted to win. Well, the match did not happen. Despite plans, it did not happen later in South Africa either. 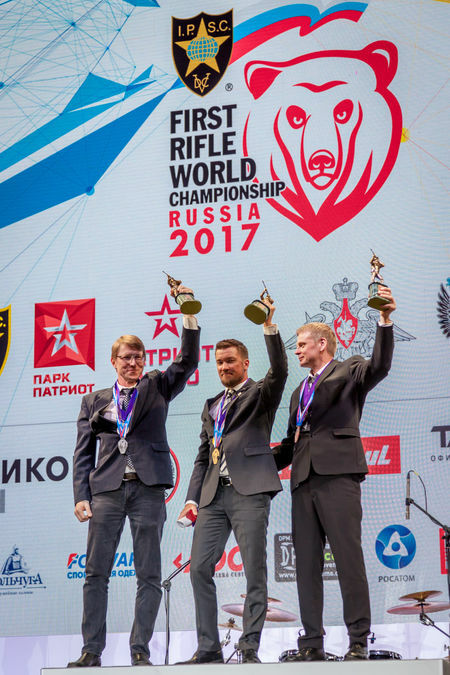 But now, finally, the first Practical Rifle World Championship took place and the event set the bar high indeed. The opening ceremony was very impressive, and everything went relatively smoothly with the bureaucracy. Patriot Park was an ideal range for such a large competition. The very reason for not having a rifle World Shoot earlier was difficulty in arranging range stages long enough. At least I prepared well, for 12 years! About 500 shots were shot at 30 different stages and distances varied from 15 to 300m. The majority of the targets were between 60-100m, but there were often a couple of nasty 200-300m targets somewhere on the stage. This made understanding the bullet trajectory an important factor. Different aiming points and different zeros had to be used quite a lot. It was also a very technical match in terms of shooting positions and gear needed. Once again, Finnish accuracy regarding both shooters and Lapua ammunition has been proven to be top class internationally! On behalf of my shooting colleagues I say: Thank you Lapua!